It’s my turn to host Asian Food Fest (AFF) this month, hooray! For the round up on Indian Subcontinent, please hop over to Alvin’s blog to take a look at the delicious dishes all the bloggers have contributed. And the theme for this month is IndoChina. My history is not the best, but Google tells me IndoChina, or more specifically French Indochina or Indochinese Federation refers to part of the French colonial empire in South East Asia. That includes Vietnam, Cambodia and Laos. Feel free to read up the informative Wikipedia page for your learning pleasure. For this event’s purpose, it’s just to group these 3 countries together so we can have more dishes to pick! 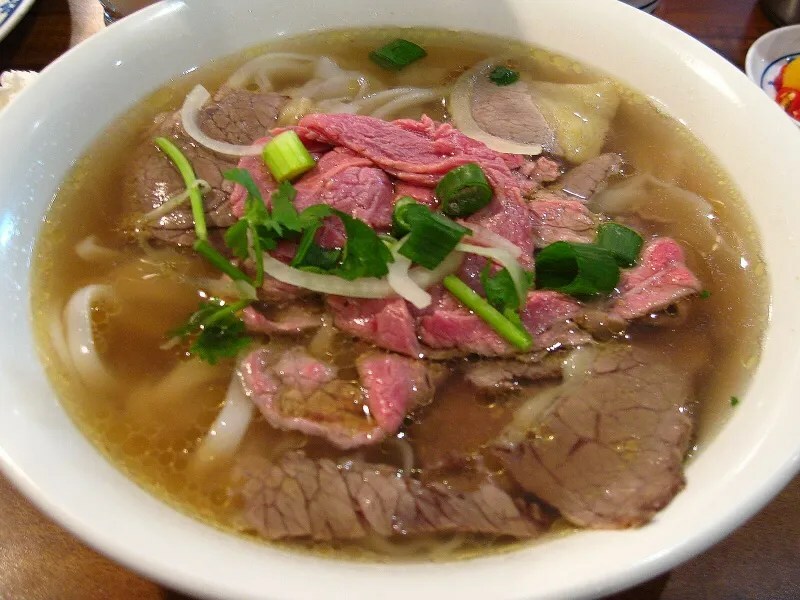 Vietnamese cuisine emphasizes on a combination of five taste elements: spicy (metal), sour (wood), bitter (fire), salty (water) and sweet (Earth), corresponding to: five organs (ngũ tạng): gall bladder, small intestine, large intestine, stomach, and urinary bladder. Each dish has a distinctive flavour which reflects these elements. 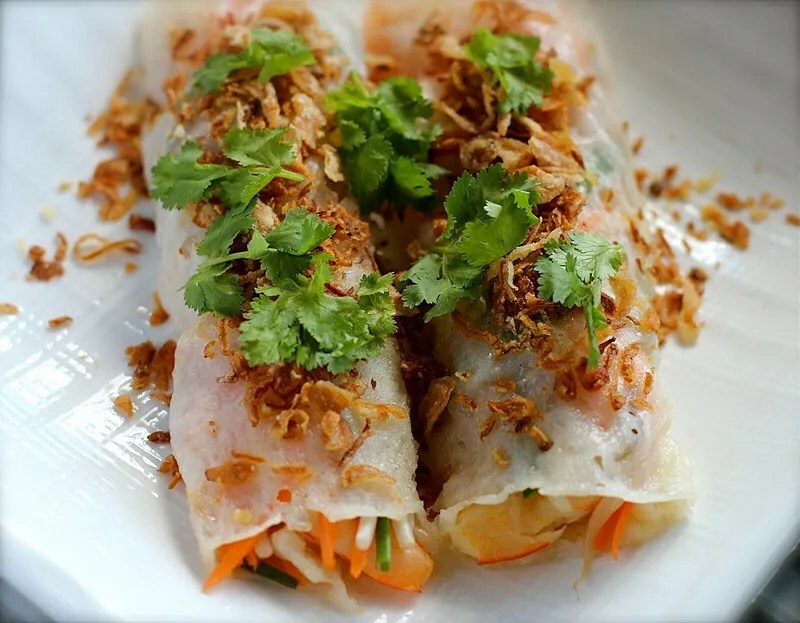 Traditional Vietnamese cooking utilizes plenty of fresh ingredients, minimal use of oil and a lot of fresh herbs and vegetables to enhance the taste. It’s actually considered one of the healthiest cuisines. Common ingredients include fish sauce, shrimp paste, soy sauce, rice, fresh herbs, fruits and vegetables. Herbs wise, a lot of recipes use lemongrass, ginger, mint, coriander, Saigon cinnamon, bird’s eye chili, lime, and basil leaves. Vietnamese dishes also include five types of nutrients (ngũ chất): powder, water or liquid, mineral elements, protein and fat. Vietnamese cooks try to have five colours (ngũ sắc): white (metal), green (wood), yellow (Earth), red (fire) and black (water) in their dishes. And then there are the five senses: Food arrangement appeals to the eyes, The sound of the crisp ingredients, five spices detected on the tongue, aromatic ingredients to stimulate the nose, and some meals can be perceived by touching. Who say food isn’t a fine art? Regional Variations: The northern Vietnam has a colder climate, which limits the production of spices. The food there is often less spicy and black pepper is more commonly used. The dishes are lighter in flavours and seafood is more widely used. The main flavouring ingredients are fish sauce, soy sauce, prawn sauce and limes. Signature dishes include bún riêu and bánh cuốn. While Central Vietnam is definitely not lacking in spices, as the cuisine in this region is well known for its spicy food. Hue’s culinary tradition features complex dishes that are highly decorative and colorful, reflecting the influence of the ancient royal cuisine. Not surprisingly chili peppers and shrimp sauce are frequently used. 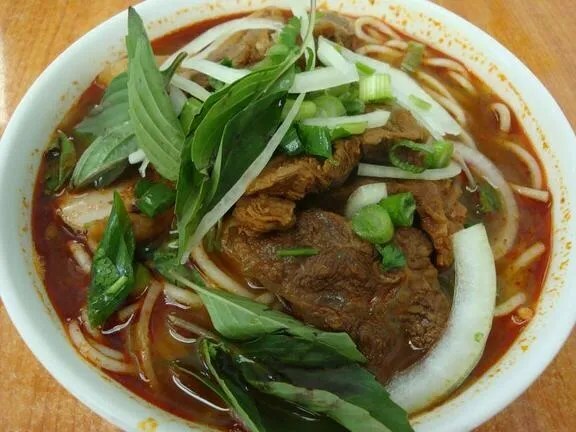 The signature dishes include bún bò Huế and bánh khoái. The southern Vietnam is blessed with warm weather and fertile soil, perfect for growing fruits, vegetables, and livestock. Food here is vibrant, flavorful, with heavy uses of garlic, shallots and fresh herbs. The dishes tend to be sweetened with sugar or coconut milk too. Broken Rice – My favourite and this was from Thanh Dat, Springvale during my last visit for Melbourne. Though you can hardly see the rice! 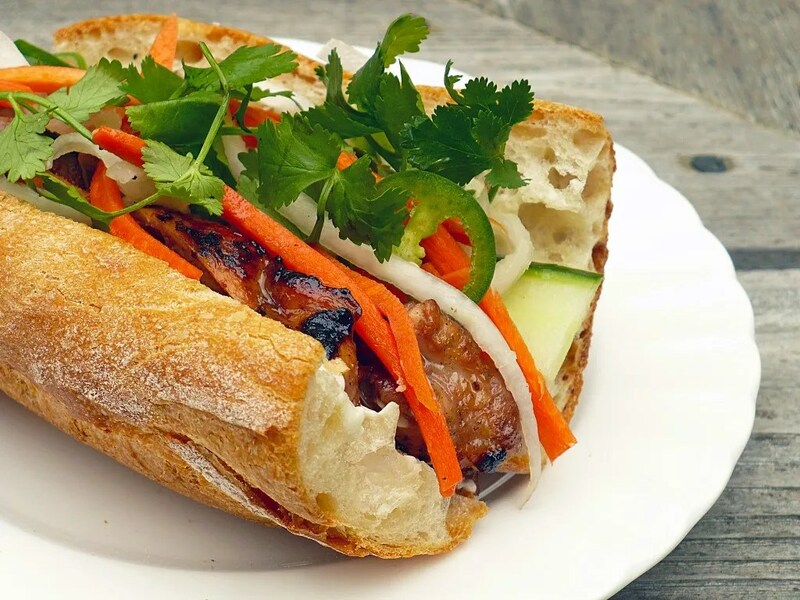 The French legacy lives on in the form of Banh Mi, a baguette filled with a variety of ingredients, though commonly pork, liver pate, fresh cucumber, pickled carrots and lots of coriander. 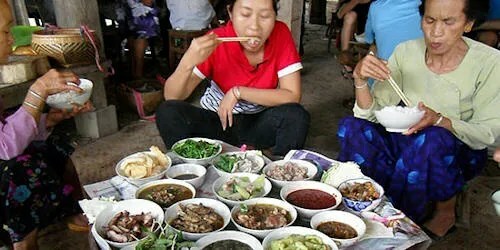 Cambodia: Cambodian (or Khmer) cuisine is said to be one of the oldest living cuisines. It emphasizes on simplicity, freshness, seasonality and regionalism: consisting of harmonious arrangement of contrasting flavours, textures and temperatures. Plenty of herbs, pickles, dipping sauces, edible flowers are used to achieve this. The staple food is rice, consumed daily by most Cambodians. Many types of rice are used here including hundreds of varieties of indigenous Khmer rice. There are countless cooking style of rice as a result and it’s even in their desserts in the form of sticky rice. Not surprisingly, rice noodles are also in abundance. During the horrors of the Khmer Rouge regime in the 1970s, Cambodian cuisine was almost wiped out. People there resorted to eating strange objects and some of these have remained a delicacy. Living standards have improved dramatically over the last 2 decades, leading to the revival of Khmer cuisine. 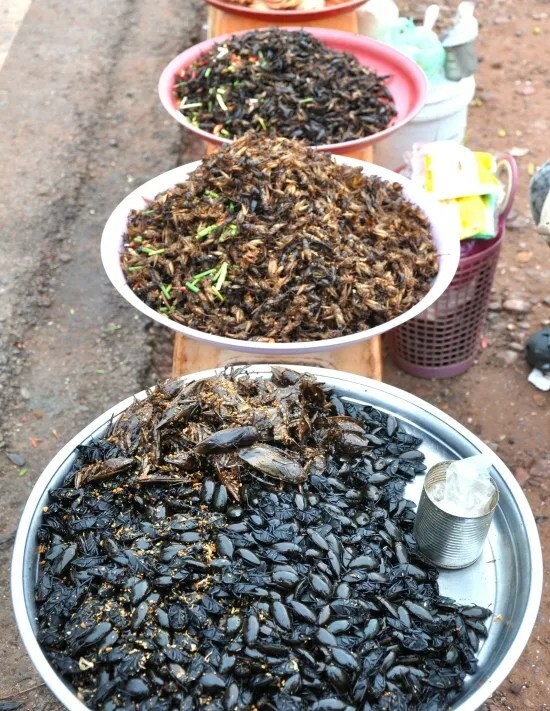 Various bugs and insects, fried, sold as street snacks. Image from travelfish. Freshwater fish is another important staple as the Mekong river cuts through the very heart of Cambodia. The Tonle Sap Lake which is connected to the Mekong river is believed to have more fish than any other in the world, ranking second only to the Amazon river. Like many South East Asian countries, Cambodia is also affected by the monsoon. 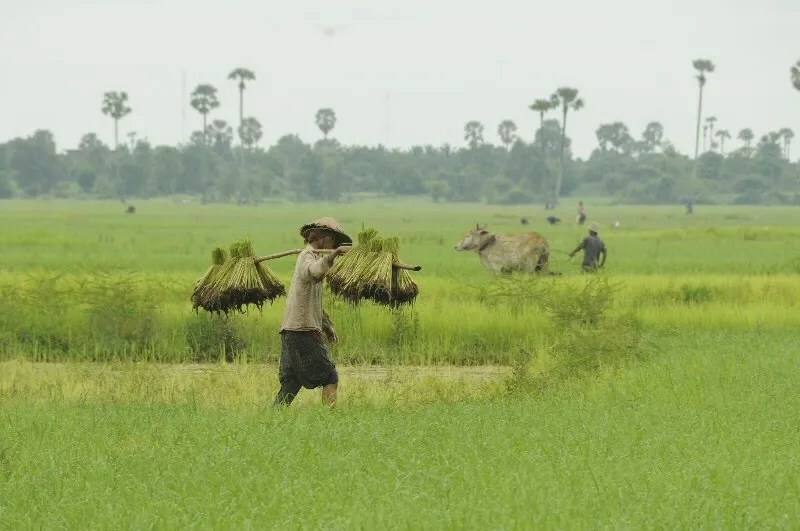 During this period, the rice-paddies turns into emerald “ocean”, which explains why Water is also an influence in Khmer cuisine. Many dishes tend to be watery, such as Cambodian curries, and dipping sauces. 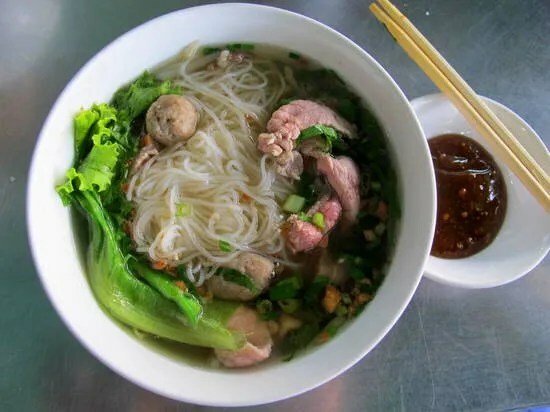 Khmer cuisine shares many similarities with Thailand and Vietnam, and it has drawn upon influences from China and France, both powerful players in Cambodian history. 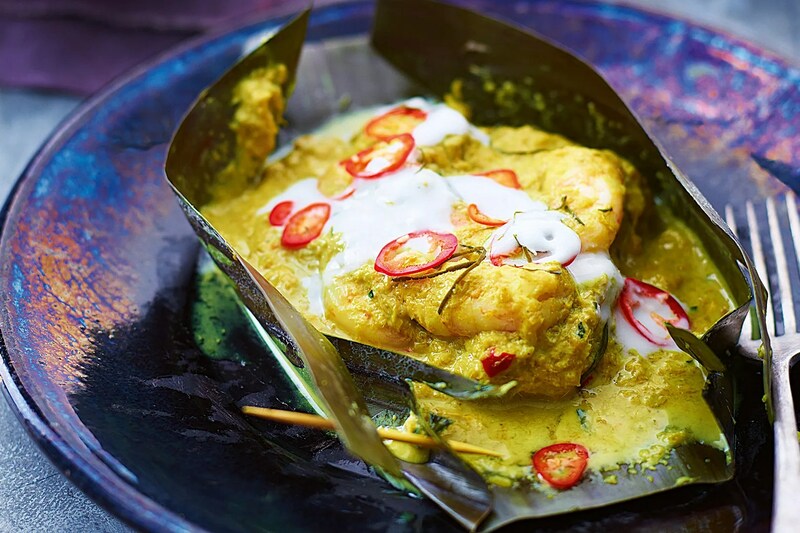 While a trace of cultural influence of India is reflected in their curry dishes. The French have left their legacy in the form of baguette (known as nom pang in Khmer), and Cambodians often eat bread with pate, sardines or eggs, pairing with coffee. Though traditionally, a meal in Cambodia typically includes a soup, a samlor, served alongside main courses. Laos The Lao originally came from the north (now part of China), and they brought their traditions with them as they moved southward. Hence it’s distinct from other Southeast Asian cuisines. 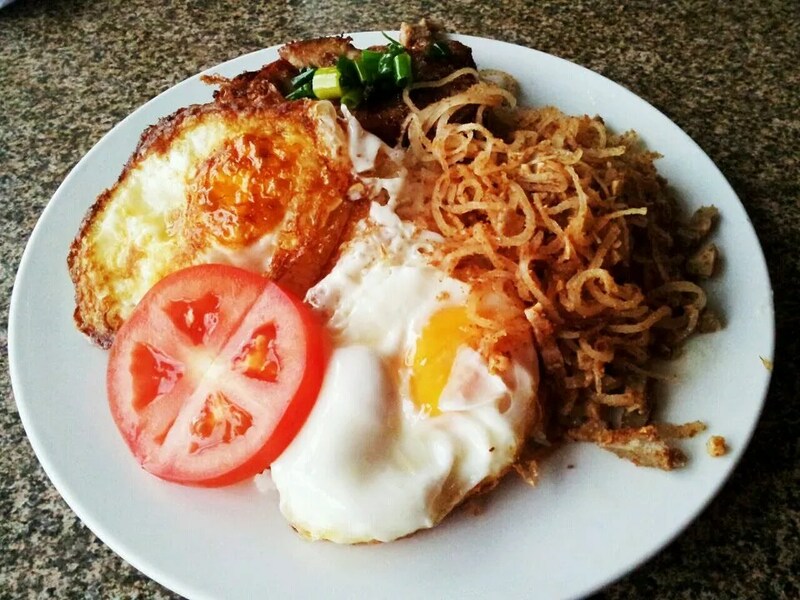 Although Lao cuisine has also influenced Northeastern Thailand and has been introduced to Cambodia, which explains the similarity of these cuisines. 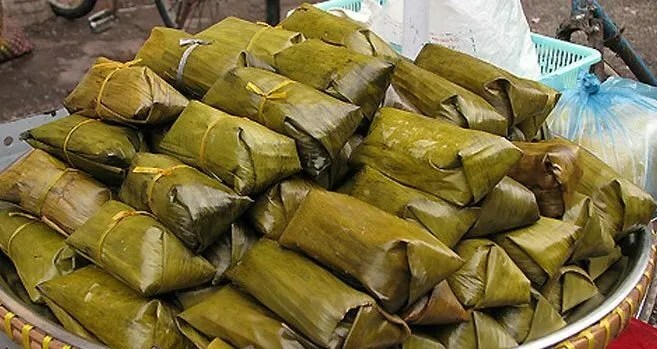 The staple food in Laos is steamed sticky rice, which is eaten by hand. Sometimes the Lao even referred to themselves as “Children/Descendants of Stick Rice” (Luk Khao Niaow). Other important ingredients include Galangal, lemongrass and Padaek (Lao Fish Sauce). A typical Lao meal includes a large quantity of fresh raw greens and herbs served undressed on the side. Savoury dishes are never sweet, and “sweet and sour” is a considered a bizarre concept to the Lao people. They even like their dishes to be bitter, as they believe “Sweet makes you dizzy, Bitter makes you healthy”. Unlike the neighbouring countries, mind and dill are commonly used here. Food is often consumed at room temperature for the ease of picking up with hand. 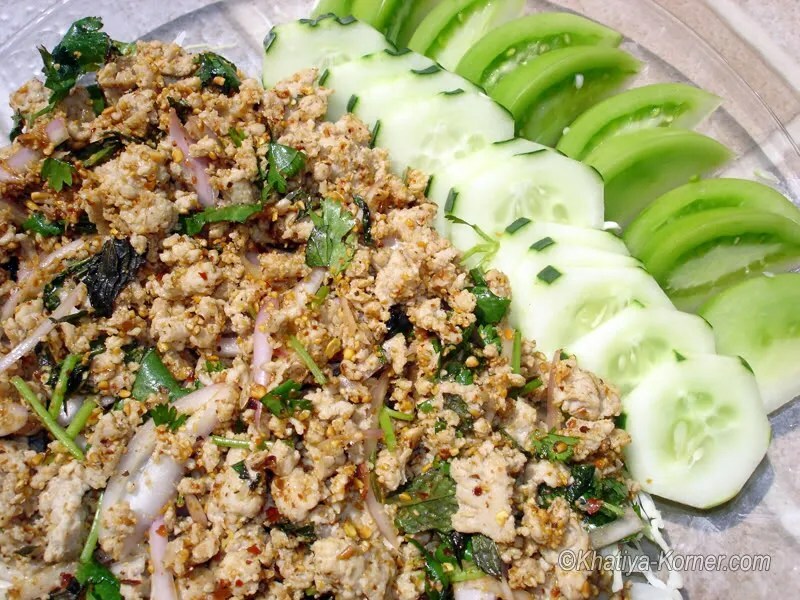 The most well-known Lao dish would be Larb, a spicy mixture of marinated meat or fish with a combination of herbs, greens, and spices. Another of Lao’s invention is a spicy green Papaya Salad (Som Tam). There are many regional variations, according to seasanility and fresh food local to the regions. Like Vietnam and Cambodia, baguettes are also commonly consumed and French restaurants are very common to this day. 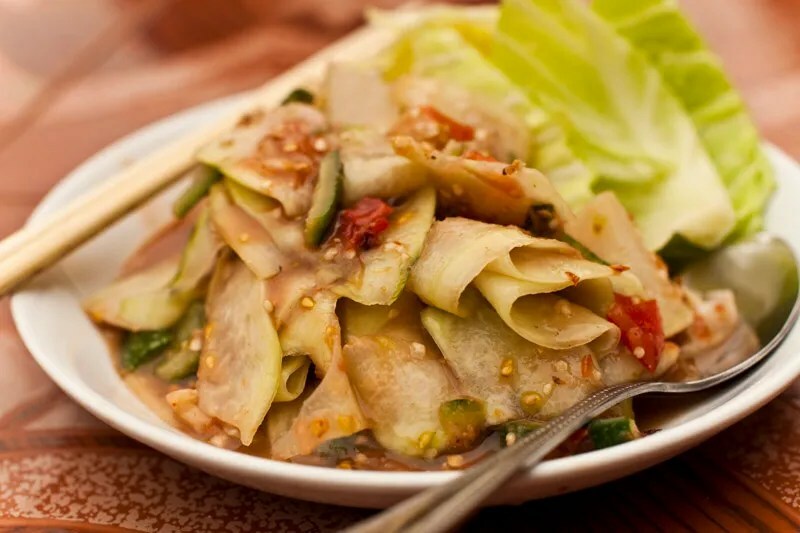 Lao Papaya Salad (dtam mak huhng) – Image from eatingasia. 1. Who can join? Anyone can join. 2. Prepare a dish (sweet or savoury) that is from India/Bangladesh/Pakistan/Sri Lanka, be it old time favourites, modern goodies or dishes that has been localized. Take a picture of the food or many pictures. 3. Provide recipe that is credited (from books, internet, friends or family or your own, be specific). Submissions without stating recipe sources will not be accepted for all forms of submission. 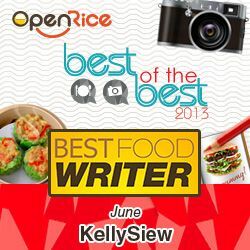 c. Include this caption below your blog post “I am submitting this post to Asian Food Fest – IndoChina hosted by Kelly Siew Cooks.” Submit your entry via the Linky provided at the end of this blog post. a. 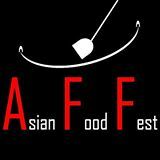 Like the Asian Food Fest Facebook page. b. 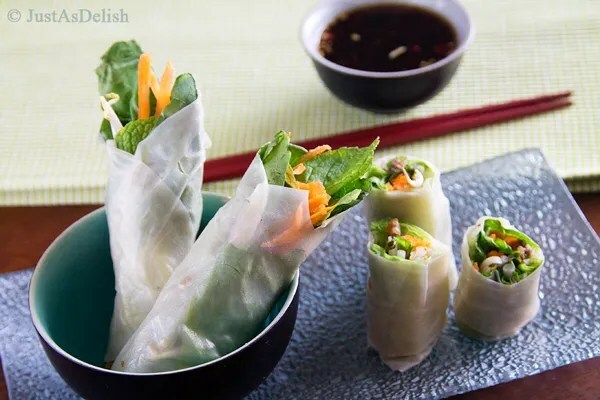 Prepare a dish ( sweet or savoury ) from Vietnam, Cambodia, Laos. c. Take a picture and upload it into Facebook on Asian Food Fest facebook page, on the timeline. d. Provide recipe with picture. Bloggers can submit old recipes to Facebook, but please state “OLD BLOG POST”. Anyone that has once cooked a Vietnam, Cambodia, Laos dish and have a picture and recipe can submit to Facebook. Not necessarily a recently done dish. Remember to submit your recipes through this link! Maybe you can join in too! Hope to see your submissions! Hi Kelly! What a great start! What a shame that I might not be able to join in the fun. I will be away to Italy with my famliy soon and back last week of June. Let me try though! Looking forward to see your submissions then! Yay.. will we get to watch you host it on TV? which channel? 🙂 The food looks awesome and I am sure your recipe rocks! Hehe it’s a blogging event so won’t be on TV. But if you have Diva Universal at home there’s supposed to be a short video of me demoing a dish. Heckuva good job. I sure aprtaciepe it. $61 bucks. Chances are you too have noticed the difference in how the timing seems to work at the red light traffic cam intersections. thought was under state surveillance. Hi! I’m new in the blogosphere so my very first post is for this AFF – Vietnam. I’m excited to post more recipes for this AFF and to try out other bloggers’ AFF IndoChina recipes too! But you probably do have some kind of a presence on the Internet. visiting your site or purchasing items from your business. for resistance to the disease will survive.